April 19, 1984…25 years ago. A date that has been one of the primary mileposts in my life. That is the day that my Dad died of cancer. I was twelve. To say that it had an impact on my life would be a massive understatement. To no small extent my identity to that point in my life had been very much tied to being “Sam Davis’s son”. He had been one of my few friends. We hunted and fished together. I worked for him during the summer (he was a plumber, electrician, AC, refrigeration, etc). My relationship with him was very much the foundation of my life. Then he died. It was early in the morning. It was almost time to wake up to get ready for school. My Mom came to get me saying she needed help…my Dad wasn’t feeling well. We tried to call the local doctor…no answer. It was a small town, so she called the doctor’s dad who lived near the doctor. I don’t remember exact details, but the doctor’s dad showed up at our house to try to help us get my Dad to the doctor. He was already dead by then. The rare cancer (Zollinger-Ellison Syndrome) had finally won. We later heard that the doctor was addicted to something and there was suspicion that he was high at the time. Was there anything he could have done had he been able to get there sooner? Probably not but, we will never know. When the doctor did show up to pay his respects a few hours later I was sitting outside. I still remember that he drove a Jeep with no top. I remember walking over and seeing a Hall & Oates cassette in the front seat. From that point on, I refused to listen to anything by Hall & Oates. That morning I remember wanting to get away. To be at the farm…in the woods hunting…for that matter I wanted to be living in the woods. To run away from all that was going on that day. My Mom had the guy who had been working for my Dad, Ellis Nasif, take my brother and I out for a drive so that we wouldn’t be there when the hearse showed up. We went to what seemed like the most natural place in town to go to on that day…the local sporting goods store owned by a friend of my Dad where we had spent a good bit of time. We bought pellets for my pellet gun. The next few days were all a blur. The funeral, the burial. His pallbearers were the men he had gone elk hunting in Colorado with. One thing that I remember is taking my Dad’s 35mm camera and taking pictures that day. I barely knew how to operate it, but the pictures turned out perfect. I’m still amazed at how those turned out…I never took pictures with that camera again that turned out worth a flip. I wrote a couple of times (here and here) before about the effect that the burial had on me…it was one of the most difficult moments of my life. Perhaps more so than the death had been at that point. Seeing my uncles shovel the dirt into the grave was simply gut wrenching. Little did I know the effects that this would have on me. I mentioned that my relationship with my Dad had been the foundation of my life. With that foundation gone, there were some significant aspects of my life that crumbled. I retreated into a shell. I spent a lot of time during lunch and recess sitting in a corner on the top row of bleachers in the gym. As far away from people as I could possibly get. I was empty and lonely. Another result of this was that I started stuttering. It was frustrating and humiliating, and I had no control over it. I hated being asked to read in class…I knew that I couldn’t do it. People who know me now are likely unaware that I ever stuttered. I haven’t since I was sixteen. I had another life changing experience then. I had been going to church for a couple of years, and had learned bits and pieces of what Christianity was about, and I had recently put it all together…realizing that I had made choices that were contrary to God…choices that caused me to be separated from God. The only solution to that separation was the sacrificial death of Jesus that was the only way to bridge that separation. God freely offered it to me…I just had to accept it. The church that I was going to had an event called “Youth Week” where all of the activities at the church were run by the teenagers. That Sunday night a guy that I knew in passing at church named Chris Kennedy had the job of preaching the sermon. I don’t remember much of what he said, but what nailed me to my seat was when he talked about how God offers us the opportunity to have a relationship with him that can never be broken. A relationship that nothing can break. I remember him reading a section of the Bible from Romans chapter 8. Did you catch that? Even death can’t break this bond? The finality of separation that death causes had been unbelievably real to me…I was never going to see my Dad again. The hope that there is a relationship that even death has no power over was a very bright light in the midst of a very dark cave. That night was the first time I let people know that I had made the decision to accept Christ as my Savior. That night I also prayed for God to take away the stuttering problem. Two weeks later I volunteered to speak at a school assembly. I had not stopped stuttering yet. Just before getting up to speak I prayed again…”God, if you don’t come through in a very big way, I’m about to make a fool out of myself.” Moments later I got up and spoke without stuttering, and haven’t had a problem stuttering since. God answered that prayer in a very very big way, and to this day I remind myself before I am speaking publicly that my ability to speak clearly is a gift from God. One regret I have is how for years I was privately critical of my Dad for one of his failings and didn’t fully appreciate the very good things that he did do. My Dad was not a spiritual leader in our family. My Mom has told me that in the months before he died that he had talked about making that more of a priority, but he didn’t live to see it through. For many years, that failure overshadowed everything else in my memory. I still loved and missed my Dad, but I had lost some respect for him because he didn’t have a positive spiritual influence on our family. In the last five to ten years I have come to have a better appreciation for what he did do well. Much of who I am today can be traced back to the influence he had on me. The time I spent working for him instilled in me an ability to tackle nearly any problem…there is very little that I will not try to fix myself. He gave me a strong work ethic. He gave me a love for the outdoors that continues to beat strongly. He had started to pass the torch of “manhood” to me before he passed away. I remember hunting with him and field dressing the last deer that he killed (part of the antler is viewable in the picture above). At one point during that, I looked up from my work on the deer and saw him standing there holding the flashlight for me. He was looking with a sense of pride. I look back on that moment as him inviting me into a path towards manhood. Five months ago, my wife gave birth to our son. We named him Sam in honor of my Dad. I hope to have as positive an impact on the lives of my children as my Dad had on mine. The pain has lessened over the last 25 years. For a long time, I dreaded April 19th every year. This is the first year in a while that I have done any serious reflecting on that day. I still love and miss my Dad. I wish he could have met my wife and kids. I wish they could have known him. You know Julie and I lost our father before we were old enough to remember. Even so, there were obviously impacts. Not the least of which is the father you know. He came into our lives while we were still very young and he and the family that we joined were, are, and always will be a true blessing. I am glad to see you celebrating your father’s life and the gifts he gave you. We all need to be grateful for those around us and for what positive impacts they have on us. Family should be there to support us and us them. We all fail in our own ways and with a little help from above, we all eventually find our gifts and hopefully use them as intended. God bless and take care of the whole troop. We’re already preparing for their trip to PA.
We’ll be praying for safe travels for all of you. Thanks for sharing your heart in this piece. So many people fail to realize the depth of pain caused by early loss of loved ones. I’m glad you have fond memories to consider — and also glad that you are continuing to grow through your loss. 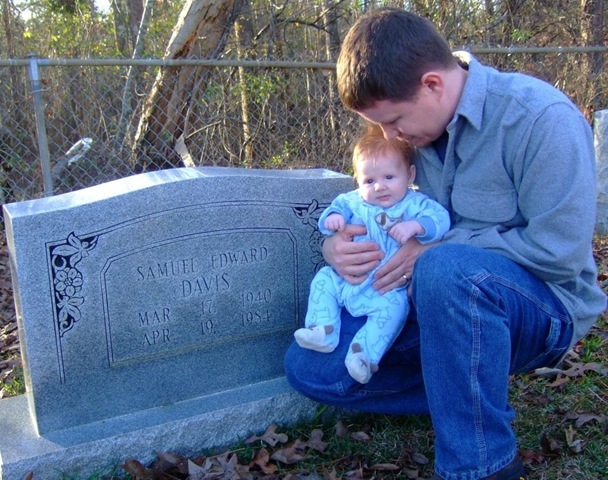 These experiences, though painful, will help shape you into an incredible father to Sam. Jarvis, you described my brother well, but I must comment. When you say “he didn’t have a positive spiritual influence,” you ignore the widows who got their light bulbs changed, the poor who were charged no more than they could afford. Need I go on? He didn’t talk the talk much (he didn’t talk any talk much), but he surely walked the walk. You didn’t fall far from the tree. You are absolutely right that he did those things. He definitely took care of a lot of people. And thanks to Roger (for others reading this…Roger is married to Sue) for quickly locating, scanning and emailing me the picture at the top of this post! Oh…and to others seeing these comments…be sure to check out my Aunt Sue’s web site (click on her name)…it is supporting a very good cause. Really moving, Jarvis. Thanks for your courage in sharing it–for yourself, for your family, for your friends.